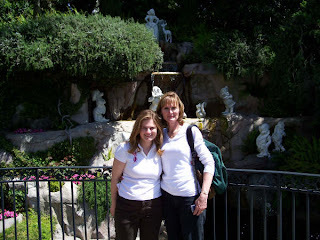 Bubbles and Blossoms: The McGaugh Family Blog: Katie's Trip to Disneyland!! With all the magic of childhood surrounding us, Katie experienced her first Disneyland adventure yesterday! Although she technically went with me once while I was pregnant with her, this was her first time seeing, feeling, and being part of Disneyland. She truly loved her experiences, and they have been all she has talked about today. I cannot wait to take her back there... We want to take her again in the fall, after Eric is born so that they can see it together and so that she can have another memory close to her 3rd birthday. I am so fortunate that the three of us---Bill, Katie, and I---all travel so well together. We get along so compatibly, and we work together to maximize the enjoyment of our experiences. Katie is highly adaptable to new situations, eating well in new places and with new food and very content to go hither and yon. She is an incredibly easy child to take places. When I woke her up early yesterday morning, I reminded her that it was Disneyland Day, and she leapt out of bed and got dressed with no fuss even though she was still sleepy-eyed. I had packed and put out clothes the night before, and so leaving the house was simple and efficient. We made a quick stop for breakfast items and then arrived in Anaheim fairly early. At Disneyland, we walked down the middle of Main Street, and she took it all in. Then, Bill pointed out Sleeping Beauty's castle! Katie grabbed my hand and took off at a run! She knows Sleeping Beauty lives there, and she has never seen a castle in person before. By this time, her excitement was quite palpable as she realized that Disneyland was indeed a special place. Here, we took a quick picture in front of the castle. Our first ride in Fantasyland was Snow White. The line for this was quick, though many people were already at the park. Bill watched the stroller (although later we would just park it) while Katie and I dashed on. This ride actually scared her in parts, with the dungeon and the evil queen turning into a witch. She put her head, in fact, into my chest. The next ride therefore was the carousel. I love the carousel, and the line at that time was quick as well. Katie loved riding up and down on the horse and her eyes were growing more and more alive with wonder at this place. At this point, we took a small break from the rides and went to explore Sleeping Beauty's castle more thoroughly. We wandered out to Snow White's wishing well and watched the fountains and the ducks swimming in the lake. This turned out to be one of Katie's favorite Disneyland spots, and we revisited it later in the day when I took her out for some shopping. We took this picture in the same spot where I took a picture when I was just a few weeks pregnant with her. I told her this yesterday, and I also reminded her how much I had wanted her and how happy I am that now she is here with me, right in the same spot. This was one of the pictures from March of 2007, when I was just a handful of weeks pregnant with her. I remember being so worried about her, since she was the first pregnancy I had after the trouble that past November. And now, to have her here with me in that same place...well, it was emotional. Not only that: yesterday I got to bring the growing Eric to Disneyland, too. I will have to tell my children that I went to Disneyland when I was pregnant with both of them. Exploring more of the castle, we climbed up the steps to Sleeping Beauty's bedroom. Katie loved seeing the fairies and the sleeping princess, but she got a little scared at parts. So much of Disney lore is both enchanting and frightening, and I was really reminded of that yesterday. The Disney versions of the stories are good ways, I think, for children to work out and sublimate insecurities. Small World was going to be next, and we stopped for churros and icy lemonades first. What is Disneyland without a churro? Daddy and Katie eat their churros in this photograph. I gave Katie half of mine and she ate about 2/3 of that portion. Then we all stood in line for Small World. Katie assessed the ride, and she said she wanted to "go in the boats!" We promised her that nothing scary would be in this ride. On the ride, she thoroughly enjoyed herself. In fact, when we were done, she immediately wanted to go again. We reminded her that we still wanted to take her on Peter Pan and that excited her completely. She has been totally enamored of the Peter Pan tale the past week or so. We found a book in the stack my mom had given us long ago, and she loved the book from the first: the pirate map, Hook, Smee, Peter's secret cave. After reading the book several times, I brought out our copy of the film. Ever since, she has pretended to be either Wendy or Peter Pan himself; Daddy, Amie, or I are Captain Hook; sometimes I get to be Mrs. Darling. We have been role playing and role playing. The line for Peter Pan was 40 minutes, and Katie did fantastically with the waiting. We talked and looked around. I showed her the Snow White queen who peeps out of the window overlooking the line for Pan. After the queen popped out the first time, Katie very pointedly avoided looking in that direction. She loved the ride! It all was incredibly real to her. She called out to Captain Hook, "You're a codfish!" and "Get him, Peter!" After this, we headed to Frontierland and my favorite, New Orleans Square. All rides on the Rivers of America were closed, due to refurbishing. That was a bit of a bummer, though we knew that would be the case before we went. We decided to grab some lunch at The Hungry Bear near the Winnie-the-Pooh ride. I had a delicious veggie burger, Bill had a cheeseburger, and I got Katie the "kid's power pack" which was awesome. Disneyland is offering healthier fare now, and so Katie enjoyed string cheese, fruit yogurt, apple slices, and whole grain fishies and her own small bottled water. Lunch was quite satisfactory, though the line was lengthy. Following lunch, we went on the Winnie-the-Pooh ride. A few times, Katie wanted to "get out and go see them" (the characters) during the ride. She clapped and squealed during the party scene. She loved it. Then we got really lucky. Characters at Disneyland can be difficult to catch, but we stood in a small line and met two of them: Pooh and Tigger. For Katie, this was even bigger than the Easter Bunny in some ways. Hugging and kissing Pooh! She also offered to feed him honey. I love her little personality: she started chatting with both of them like old friends, not the least shy. Even the characters' helpers commented on how cute and friendly she was, especially for being so young. She was so excited to meet Tigger, even more than meeting Pooh. We have this little thing we do, especially on the way to music class. We imagine all the places Tigger has been bouncing. Anywhere where there are orange flowers is a spot he has bounced. We shout, "Tigger flowers! Tigger flowers!" whenever we pass big patches as a we drive. Our next desire was to take Katie on Pirates of the Caribbean---an absolute favorite of mine. Approaching it, though, we saw ropes of people several feet away. I have never seen the Pirates line so long. Yesterday was crowded at Disneyland. We thought, therefore, that we would wait it out. (Later, we would come back and get in line more toward the official entrance only to wait 10 minutes before suddenly people started exiting saying that the ride had just broken down---we'll go next time for sure). So we headed toward some shade and seats at one of the nearby restaurants. Bill had a lemonade, and Katie and I shared a mint julep (non-alcoholic naturally) while we all listened to live performers play some bluesy jazz. This had to be one of my favorite parts of the day. The outdoor patio wasn't too populated, and we all love live music. Katie loved the mint julep! I think this will be one of our new traditions in New Orleans Square. When we finished our mint julep, I decided that we would leave Bill to enjoy the music and I would walk Katie until she napped. She must be tired, we thought, and it was the time of day when she usually naps---if she naps. I walked her for a good hour, all around the park. We shopped for a Peter Pan play set and also for a big Disneyland lollipop, and after all that, she was still awake when we returned to Daddy! So much excitement! We let her enjoy her lollipop for awhile! I think this will be a tradition, too. We have it in the fridge today, and she has licked on it a little bit today. I think it will last for months! Our next idea was to try the train. We boarded at the New Orleans station and savored the trip around the park. Katie really loved the train. We knew that we should grab some dinner, and we all wanted to sit down for awhile. We went to the Carnation Cafe on Main Street---a memory from my childhood. The whole day, it was so wonderful and surreal and magical to have Katie there, showing her these places and things. She was starving and ate some of my chef's salad, a hot dog, and strawberries. She handled herself really well, while I managed to spill my water everywhere. :-) We were all tired, but that girl can keep on going with hardly a pause! Immediately after dinner, we indulged in ice cream from Gibson Girl Ice Cream next door. Bill had a scoop of strawberry (so disciplined!) and Katie and I shared a chocolate chip cookie ice cream sundae. Sooooooooooooooooooooooooo good! We ate our treats sitting on Main Street on the sidewalk, as I have memories doing, as the night began to fall. Vendors came out with the necklaces and balloons and goodies that shine in the night. After our sundae, we had Bill hold our seats for the fireworks. Katie and I headed back to Fantasyland and she chose a glowing, color-changing rose. The castle gleamed in the distance and Katie waved her rose in delight---this was one of my favorite memories of the whole trip. Back in Fantasyland, we waited in line for the Dumbo ride as Katie played with her rose and everything took on an even more magical feel in the darkness. Katie loved Dumbo so much! She was grinning from ear to ear, and I let her control the lever. We went up and down, up and down. When I pointed out how high we were relative to Sleeping Beauty's castle, she thought that was so neat... In fact, when we deboarded, she immediately tried to get into the very next empty elephant. I had to explain that others needed their turns, too, and I reminded her about the fireworks. She agreed that we should walk back to Daddy and get ready to see them. As we sat there waiting for the fireworks, Katie fell asleep! She wanted to see them so much, and we tried to wake her up---but she was completely conked out. Next time. I wished she could have seen them, though! The Disneyland fireworks were amazing. I actually teared up a couple of times, once when they played a snippit of music from the Electric Light Parade---so very much my memory of childhood there, sitting on Main Street with my parents. And now I am there in almost the same spot with Katie. We waited after the fireworks for the crowd to clear a bit, and we left the park around 10:15 and headed to the parking lot tram. Katie only stirred once but stayed asleep until we got home at 12:30 in the morning. When we got home, I put her on the bed and started drawing water for a quick sponge bath for her. She woke up and said she wanted her full bath. We bathed quickly, got into jammies, and then---to my surprise---she fell back asleep shortly after 1 AM very easily. We slept in until 8:45 this morning, and everyone seems to be back on schedule more or less today. I am pleased with how easily she adapts to different schedules and outings. I was a bit worried on the way home that we would be awake for awhile, so I was pleasantly surprised that it all worked out so well. We had an amazing day, and I loved sharing those memories with her!